Eric Kurlander teaches classes on modern German, European and world history. 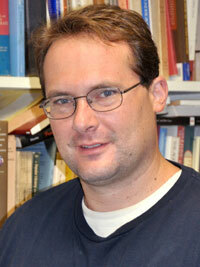 Eric Kurlander, Ph.D., is a professor of modern European history at Stetson University. Kurlander earned his B.A. at Bowdoin College and his M.A. and Ph.D. at Harvard University, teaching three years at Harvard before coming to Stetson in 2001. He offers courses on Modern German, European and World History. His recent monograph, Hitler’s Monsters: A Supernatural History of the Third Reich (Yale, 2017), offers the first comprehensive study of the supernatural in Nazi Germany, illustrating how the Third Reich drew upon a wide variety of occult practices, esoteric sciences and pagan religious ideas to gain power, shape propaganda and policy, and pursue their dreams of racial utopia and empire. The book has been reviewed positively in the Washington Post, Times of London, Der Spiegel, the National Review, as well as other prominent periodicals in the United States, Canada, Great Britain, Germany, France, and Italy. The book has recently appeared in paperback and been translated into Italian and Polish. Kurlander’s other books include two edited volumes, Revisiting the ‘Nazi Occult’: Histories, Realities, Legacies, co-edited with Monica Black (Camden House, 2015) and Transcultural Encounters between Germany and India: Kindred Spirits in the 19th and 20th Centuries, co-edited with Joanne Miyang Cho and Douglas McGetchin (Routledge, 2014). His second monograph, Living With Hitler: Liberal Democrats in the Third Reich (Yale University Press, 2009), illuminates the ways in which German liberals negotiated, resisted, and in some ways accommodated the Third Reich. His first book, The Price of Exclusion: Ethnicity, National Identity, and the Decline of German Liberalism, 1898-1933, appeared in 2006. He has published articles in leading journals, including Central European History, German History, and The Journal of Contemporary History, and held research and writing fellowships from the Fulbright Foundation; Alexander von Humboldt Foundation; the German Historical Institute; the German Academic Exchange Service; the Krupp Foundation; and Harvard University's Program for the Study of Germany and Europe. At Stetson, Kurlander has received the William Hugh McInery Award for Excellence in Teaching, the Hand Award for Excellence in Research and Creative Activity, and contributed to the university in numerous leadership roles. He has served as Chair of the History Department, Chair of the Sociology and Anthropology Department, Chair of the Professional Development Committee, Chair of the Arts & Sciences Tenure and Promotion Committee, and Chair of the Faculty Finance and Budget Committee as well as multiple terms on the Faculty Senate. His current projects include a textbook, Modern Germany: A Global History (under contract with Oxford University Press) and a monograph, Before the Final Solution: A Global History of the Nazi “Jewish Question”. In his free time, Kurlander enjoys parenting, reading, travel, sports, and popular culture. Modern German and European politics, culture and society, 1870-1945, with a particular emphasis on liberalism, nationalism and anti-Semitism in Wilhelmine, Weimar and Nazi Germany. Modern Germany: A Global History (with Bernd Grewe and Douglas McGetchin). New York and Oxford: Oxford University Press (under contract). I Mostri di Hitler: La storia soprannatural del Terzo Reich[Italian edition of Hitler’s Monsters]. Milan: Mondadori, 2018. Hitler’s Monsters: A Supernatural History of the Third Reich. New Haven and London: Yale University Press, 2017. Monica Black and Eric Kurlander, eds., Revisiting the Nazi Occult: Histories, Realities, Legacies. Rochester: Camden House, 2015. Joanne Miyang Cho, Eric Kurlander, and Douglas McGetchin, eds., Transcultural Encounters between Germany and India: Kindred Spirits in the Nineteenth and Twentieth Centuries, New York and London: Routledge, 2014. Living With Hitler: Liberal Democrats in the Third Reich, 1933-1945. New Haven and London: Yale University Press, 2009. The Price of Exclusion: Ethnicity, National Identity, and the Decline of German Liberalism, 1898-1933. New York and Oxford: Berghahn Books, 2006. “Liberalism Between Retreat and Accommodation: The Role of Politics, Class, and Ideology, 1930-1934.” Norbert Frei and Kristina Meyer, eds. Wie bürgerlich war der Nationalsozialismus? Göttingen: Wallstein, 2018, pp. 63-77. “Völkisch-Esoteric and Völkisch-Religious Movements in Germany and Austria, 1890-1945.” Michael Fahlbusch, Ingo Haar, Alexander Pinwinkler, eds., Handbuch der völkischen Wissenschaft (2nd Edition). Berlin: De Gruyter, 2017. “Otto Scheel.” Michael Fahlbusch, Ingo Haar, Alexander Pinwinkler, eds., Handbuch der völkischen Wissenschaften (2nd Edition). Berlin: De Gruyter, 2017. “‘One Foot in Atlantis, One in Tibet.’ The Roots and Legacies of Nazi Theories on Atlantis, 1890-1945.” Leidschrift: Historische Tijdschrift, v. 42, nr. 1 (January 2017), pp. 81-102. “The Nazi Magician’s Controversy: Enlightenment, “Border Science”, and Occultism in the Third Reich. Central European History, v. 48, nr. 4 (December 2015), pp. 498-522. “Hitler’s Supernatural Sciences: Astrology, Anthroposophy, and World Ice Theory.” Monica Black and Eric Kurlander, eds., The Nazi Soul Between Science and Religion: Revisiting the Occult Roots of Nazism. Elizabethtown, NY: Camden House, 2015, pp. 132-156. “Liberalism in Imperial Germany, 1871-1918.” Matthew Jefferies, ed., Ashgate Research Companion to Imperial Germany. London: Ashgate, 2015, pp. 91-110. “Between Weimar’s Horrors and Hitler’s Monsters: The Politics of Race, Nationalism, and Cosmopolitanism in Hanns Heinz Ewers Supernatural Imaginary.’”Rainer Godel, Erdmut Jost und Barry Murnane, eds. Zwischen Popularisierung und Ästhetisierung? Hanns Heinz Ewers und die Moderne. Bielefeld, Moderne Studien (Aisthesis), 2014, pp. 229-256. “The Orientalist Roots of National Socialism? Nazism, Occultism, and South Asian Spirituality, 1919-1945.” Joanne Miyang Cho, Eric Kurlander, and Douglas McGetchin, eds., Transcultural Encounters between Germany and India: Kindred Spirits in the Nineteenth and Twentieth Centuries, New York and London, Routledge, 2014, pp. 155-169. “Hitler’s Monsters: The Occult Roots of Nazism and the Emergence of the Nazi ‘Supernatural Imaginary.’” German History,v. 30, nr. 4 (December 2012), pp. 528-549. “Between Völkisch and Universal Visions of Empire: Liberal Imperialism in Mitteleuropa, 1890-1918.” Matthew Fitzpatrick, ed., Liberal Imperialism in Europe, London: Palgrave, 2012, pp. 141-166. “Violence, Volksgemeinschaft, and Empire: Interpreting the Third Reich in the Twenty-First Century.” Journal of Contemporary History, 46 (October 2011), nr. 4, pp. 920-934. “Between Detroit and Moscow: A Left Liberal Third Way in the Third Reich.” Central European History, v. 44, nr. 2 (May 2011), pp. 279-307. “‘I Am No Anti-Semite, but I Am Also No Jew’: Liberalism and The ‘Jewish Question’ in the Third Reich.” Bulletin of the German Historical Institute, nr. 42, Spring 2008, pp. 49-63. “Otto Scheel.” Michael Fahlbusch and Ingo Haar, eds., Handbuch der völkischen Wissenschaften. Munich: K.G. Saur, 2008, pp. 614-619. “The Landscapes of Liberalism: Particularism and Progressive Politics in Two Borderland Regions.” David Blackbourn and Jim Retallack, eds., Localism, Landscape, and the Dilemmas of Place: Germany 1871-1918, Toronto: University of Toronto Press, 2007, pp. 124-146. “Völkisch Nationalism and Universalism on the Margins of the Reich: A Comparison of Majority and Minority Liberalism in Germany, 1898-1933.” Mark Roseman, Neil Gregor, and Nils Roemer, eds. Germany From the Margins, Bloomington: Indiana University Press, 2006, pp. 84-103. “New Approaches to Bourgeois Resistance in Germany and Austria, 1933-1945.” History Compass, v. 4, nr. 2 (2006), pp. 275-292. “Negotiating National Socialism: Liberal Non-Conformity and Accommodation in the Period of Gleichschaltung.” Jahrbuch zur Liberalismus-Forschung, v. 17, 2005. pp. 59-76. “Republikanischer Partikularismus als elsäßische Integrationsmodell zwischen Kaiserreich und Nationalsozialismus.” Elke Huwiler und Nicole Wachter, eds., Integrationen des Widerläufigen, Hamburg: LIT-Verlag, 2004, pp. 93-102. “Otto Scheel: National Liberal, Nordmark Prophet.” Michael Fahlbusch and Ingo Haar, ed. German Scholars and Ethnic Cleansing 1920-1945. New York and Oxford: Berghann Books, 2004, pp. 200-212. “Nationalism, Ethnic Preoccupation and the Decline of German Liberalism: A Silesian Case Study, 1898-1933.” The Historian, v. 65, nr. 1, Fall 2002, pp. 95-121. “Multicultural and Assimilationist Models of Ethnopolitical Integration in the Context of the German Nordmark, 1890-1933.” The Global Review of Ethnopolitics, v. 1. nr. 3, March 2002, pp. 39-52. “The Rise of Völkisch Nationalism and the Decline of German Liberalism: A Comparison of Schleswig-Holstein and Silesian Political Cultures, 1912-1924.” European Review of History, v. 9. nr. 1, January 2002, pp. 23-36.